The leader in steel fabrication for Colorado, Wyoming, and the Western U.S., Puma Steel is outstanding among steel suppliers with over a thousand tons in our Cheyenne yards. We offer structural steel and miscellaneous steel fabrication to contractors who appreciate high quality, exceptional customer service, product excellence, technical innovation, a focus on safety, and unparalleled efficiency—qualities unsurpassed by other steel fabricators and steel suppliers. To ensure superior service, Puma dedicates an in-house team of professionals to each project, including engineers, project managers, and quality specialists. We are now in our third decade of service in structural steel and steel fabrication. Wyoming owners and contractors benefit from the convenience of our Cheyenne fabrication facility, which covers 65,000 square feet and 12 acres. We are located close to the intersection of I-25 and I-80, with direct access to highway and rail transportation. 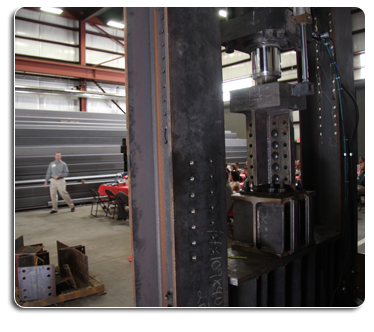 For steel fabrication, Wyoming customers choose Puma Steel. Steel Fabrication Across the Western U.S.
With successful projects in Arizona, California, Idaho, Nebraska, New Mexico, Nevada, Texas, and Utah, we have provided the same value across the Western U.S. that we consistently provide to our local customers. Our location at the intersection of I-80 and I-25 makes us an economical choice among steel fabricators for the Western region. Our mission is to support our customers in their endeavors by understanding their needs, and committing to their goals and objectives through delivery of quality products and services with unmatched values.